Work to destroy a large area of woodland as part of a government-backed paper mill project in Central China has sparked protests from ecologists and farmers. About 146,000 mu (9,733 hectares) of hillside forest in Xianning, a prefecture-level city in Hubei province, has already been hacked down under the orders from the local authorities. Residents in surrounding villages, many of whom use the woodland to grow trees and fruits, said they only found out about the slash-and-burn plans after the first bushfire was started. "We weren't informed about the fire," said Wang Xiangzhong, a 48-year-old villager in Tongshan county, who found his forestland ablaze in March. He recalled that strong winds blew the inferno beyond its planned boundaries and took firefighters and villagers three days to extinguish. "It was only after the incident we learned our land had been given (by the government) to a pulp paper company," he said. In an effort to cash in on the city's rich forestry resources and boost growth, Xianning signed a deal in 2008 with Chenming Paper Group, a leading firm based in Shandong province, for pulp plantations and a manufacturing plant with an estimated annual capacity of a million tons. Under the agreement, the city will lease 1 million mu of woodland to Chenming for 50 years, with the company paying landowners 12.8 yuan ($2) per mu per year - considerably less than the average 30 yuan for similar projects across China, according to GF Securities, industry analysts based in Guangdong province. In phase 1, the city's six county-level authorities have been assigned to plant poplars and pines (both ideal for pulping and papermaking) across 300,000 mu of cleared woodland by the end of next year. To meet the target, authorities have been organizing teams to carry out lian shan (it translates as clearing the mountain), which involves cutting down the original trees and starting fires to remove residual trunks and leaves. In Doumenqiao, a village in Chibi county, villagers have already cleared a patch of about 200 mu and planted red pine saplings. Ma Yanlin, the village's Party secretary, said his first-phase assignment of 5,000 mu is an "arduous task" made harder by the residents' reluctance to take part. He insisted, however, that all villagers had approved the paper mill project and that it will generate economic returns and job opportunities. Chenming will pay 320 yuan for every mu of pulpwood they plant: 200 yuan for lian shan and digging holes for the saplings, and 120 for tree planting, said Ma. The first installment will arrive in July, explained the Party secretary, while the rest will be paid in September, when villagers will need to replant any dead saplings. When contacted to comment, Gao Jianjun, director of Xianning forestry bureau's administrative office, played down the authority's role in the project, saying it was simply a deal between Chenming and the villagers. The government had acted only as a "service provider", he said. The major task for the bureau is to transform 86,000 mu of "low-yield woodland" every year into plantations of timber and fruit trees, said Gao, who added that cutting down natural forest to make way for cash crops is strictly prohibited. "Low-yield forests usually bring little economic benefit because their fruit or timber production is lower than average," he said. A more straightforward term for low-yield hillside forest is huang shan, or "waste mountain", which is the way Ma described the mountains surrounding his village. Although their slopes are covered with a mix of mature trees, such as pines, oaks and Chinese maples, and all are in natural and good condition, the cadre insisted the mountains "have no economic value". The mild climate, abundant rainfall and favorable soil conditions in Xianning provide a good environment for flora (the city is well known for bamboo and osmanthus). Although mountains take up about 60 percent of Xianning's territory, forestry contributes just 7.5 percent of its economic output, suggesting resources are not being fully tapped, said Zou Jizhou, director of the city's forestry bureau. "The forest-pulp-paper project will not damage the environment," he said, "but it will further boost the exploration and utilization of forestry resources in Xianning." Environmentalists, however, fear that replacing natural and varied woodland with just one species of tree could damage the ecosystem in the long term. A sound ecosystem and biodiversity - a rich variety of plants, animals and insects - is the key standard when assessing the quality of a forest, said Lu Zhi, a professor of conservation biology at Peking University. "The real crisis is we're running out of natural forests on this planet," she said. Greenpeace campaigner Yi Lan also warned that man-made woodlands do not have the natural and complicated correlations between plants, insects and microorganisms that can provide important eco-services, such as water and soil conservation. "With man-made or commercial forests, the varieties of plants are limited," she said. "Their growth also relies much on management and protection and sometimes fertilizers and pesticides are used, which creates pollution. The ecological benefits are very poor." Replacing natural forests with man-made ones, said Yi, can even cause disasters, such as floods and mudflows. "Afforestation is one thing but destroying indigenous forests and then planting trees for economic purposes is another," she added. A 2006 report by Greenpeace stated that China only has a small area of intact forests left - less than 2 percent, with most in the Tibet autonomous region, Yunnan province and in the northeast. Figures released by the State Forestry Administration also show that natural forests take up about 61 percent of the country's total woodland. Some communities in Xianning have reacted angrily to the Chenming Paper Group project planned for their land. 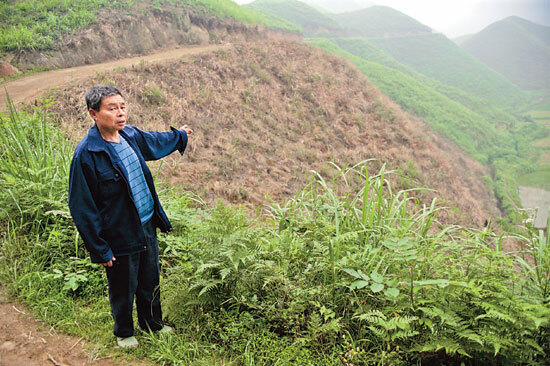 "We will not benefit from the project," said Luo Yanqing, a villager in his 50s from Chibi county. "Obviously we can make more money by managing the forest ourselves, but what can we do?" He said 400 mu of woodland collectively owned by his working group (villagers are often divided into working groups to manage set plots of land) was allocated for the paper mill project without any consultation by the county government. "About two decades ago, we planted fir trees on our land after it was designated to our group," said Luo. "Now, the village committee said the trees belong to them. "They cut the trees down, sold the timber and gave the land to Chenming without even telling us." Several village groups even attempted to block the paper company's tree-planting teams from accessing the forest. The work has been postponed until the dispute is settled, said Luo. A spokesperson for Chenming was unavailable to comment on the project. In China, forests are owned by the State and managed by rural collectives, and reforms to the system in 2006 mean collectives (a cluster of villages) can now choose to allocate land to individual households, while private investors can also lease woodland for 50 years to establish plantations. However, before any work can start, all tenants must have a certificate proving their forest tenure. The reform, which affected more than 400 million landowners and 100 million hectares of forest, was aimed at giving farmers greater power over their land, improving livelihoods and better protecting the nation's woodland. In Xianning, however, not one villager interviewed by China Daily knew about the 4-year-old policy, nor have they received the necessary certificates. Instead, they are still working to the vague boundaries set when the land was originally allocated in the 1980s. Gao at the Xianning forestry bureau said that 90 percent of the forest tenure was reallocated to households, yet according to GF Securities, Chenming has already secured certificates for 710,000 mu of the 1 million promised by the city authorities. The discrepancy suggests loopholes in the implementation of the policy, said experts. A survey of more than 3,000 households in 288 villages across eight provinces led by Xu Jintao, a professor of natural resource economics at Peking University, discovered only about 7 percent of the forest tenure was ever actually reallocated. Less than 30 percent of households said they were consulted about reallocation decisions, showed the resulting report. As a result of the forest tenure reform, woodlands could fall into the hands of just a few businesses specializing in cultivating cash crops or timber trees, said Shen Xiaohui, a senior engineer with Beijing-based group, Friends of Nature. Without a sound monitoring system, forestry departments can easily classify a piece of natural forest as huang shan where afforestation is needed, opening the door for new commercial plantations, he warned. "This would cause the loss of the basic function of forests," said Shen, who added that government-backed forestry projects can result in the undervaluing of forestry resources and damage farmers' livelihoods. 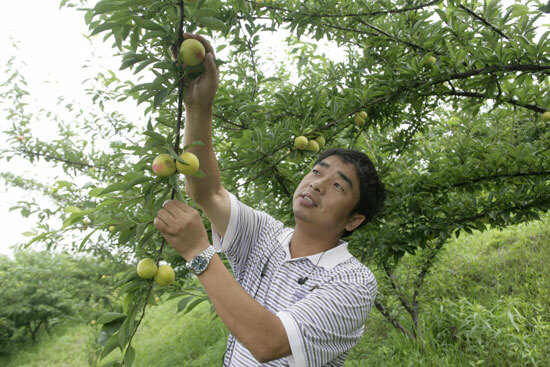 Shi Zhimin, owner of an organic orchard in Xianning, said he believes it is the authorities' responsibility to balance economic benefit with ecological impact. "Average farmers do not have the knowledge about the ecological functions of forests and they are inclined to be driven by economic returns," he said. "The government needs to take both these factors into account and offer a clear guidance." All forestry projects, even an organic orchard, have potentially negative impacts," he said. In the first few years after removing bamboo and its roots from the land, Shi witnessed a serious loss of soil, which was carried away by rain until he introduced a special variety of grass from Taiwan province. "The government needs to make a thorough assessment of the overall economic and ecological benefits before starting any forestry projects," added Shi.